New York-based Oryany offers stylish and functional leather handbags featuring luxurious and practical designs. The collection is known for signature hardware, rich color palettes, and contemporary styles. Are you ready for the really interesting part? Well, this beautiful handbag is actually currently on "sale" at Neiman Marcus. 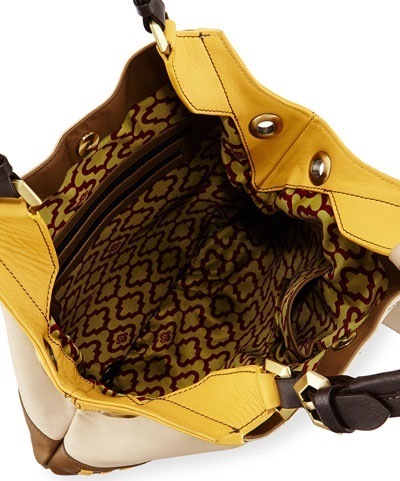 Oryany slouchy tote in colorblock pebbled leather. Buckled flat top handles; 7" drop. Adjustable shoulder strap with rings; 14.5" drop. Large front zip pocket on bottom panel. Magnetic snap top for on-the-go access. Inside, signature printed lining; two zip and two open pockets. 11.5"H x 15.5"W x 2"D; weighs 2lb. 6oz. Learn more about orYany handbags at their website. 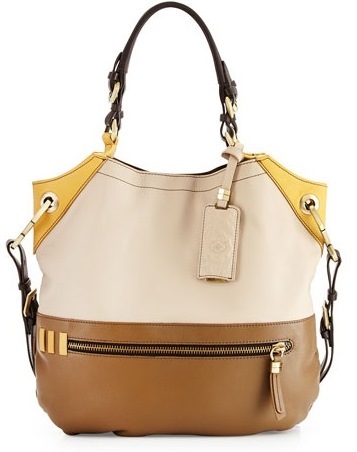 Find more information about designer handbags in the new designer handbag section here on Apparel Search.